【1080P Cam with Motion Tracking】 ieGeek 1080P Full HD IP Wireless camera with H.265 video compression technology, give you more clearer image and video; Combined with 355° horizontal & 90°vertical rotation range to achieve 360°panoramic viewing. Watch any corner you want in the panoramic screen with a tap, no any blind zone; Using advanced technology, ieGeek 1080P smart camera supports motion tracking to track and capture its movements automatically. 【Super-Efficient Two-Way Audio】 Features a professional noise reduction chip, high quality integrated microphone and speaker reduce background noise and improve audio output. It supports two modes: Intercom mode, one side talk and listen, you can talk to your pet; Hands-free mode: Free conversation between the two parties, you can keep in touch with your family by APP. A little change brings you great happiness. 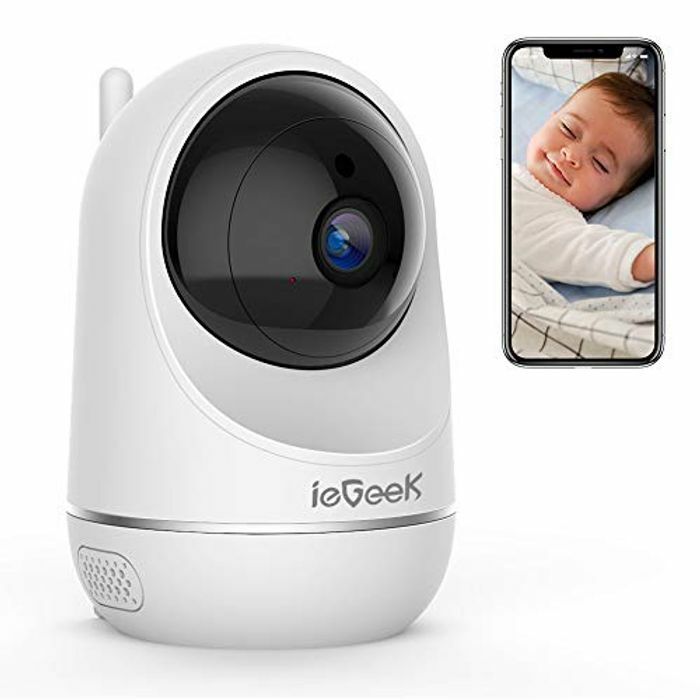 【Baby Crying Detection and Indicator Light Switch】 ieGeek Smart Camera will help you take care of little baby. When baby is crying, the app will inform you timely, not worrying that you can't always keep your eyes on baby (only under cloud); Meanwhile, you have the choice to turn off the infrared light to avoid baby/pet being disturbed by LED glare, creating a comfortable environment for your family. 【Personalized Cloud Storage】Enjoy the loop-recording with no storage limit with extra cloud service. Besides, It protects your secrets and videos from damage and leakage with financial-industry standard encryption when your camera or SD card is stolen. At the same time, you can enjoy more features through cloud storage. Eg, Time switch, Humanoid detection, Abnormal sound detection and more. Our camera will send you a notification when it detects abnormal sounds, baby crying, and noise.